Washington (AFP) - Special Counsel Robert Mueller's team has told the White House that whatever evidence it comes up with in the Russian meddling probe, it cannot indict President Donald Trump, according to Trump lawyer Rudy Giuliani. 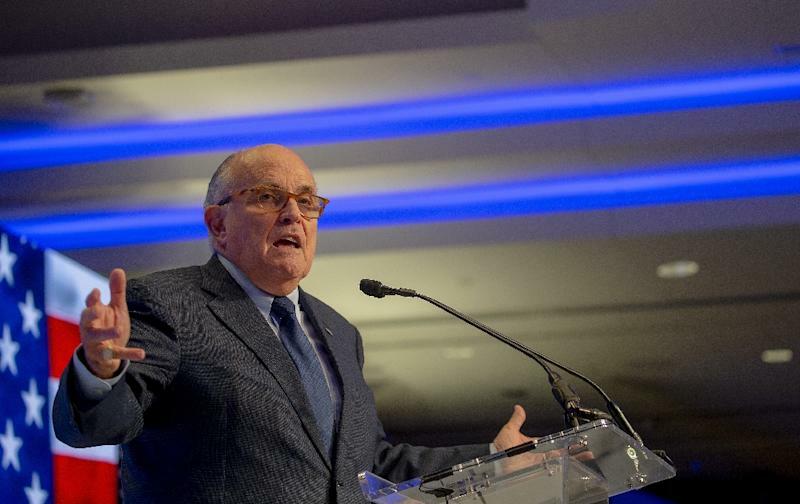 Giuliani told CNN and Fox News on Wednesday that Mueller's team had accepted a longstanding, though never tested Justice Department legal interpretation that a sitting president is immune from indictment. "All they get to do is write a report," Giuliani told CNN. "They can't indict. At least they acknowledged that to us after some battling, they acknowledged that to us." Mueller's spokesman Peter Carr refused to comment on Giuliani's remarks, which came on the eve of the one-year anniversary of Mueller's appointment in charge of the probe into possible links between the Trump campaign and Russia. But if correct, it would only confirm widespread belief in the legal community that the president is protected from indictment while in office. As Giuliani said, if Mueller does find wrongdoing by the president, he is confined to submitting a report to the Justice Department. But that report, and the evidence behind it, could serve as the basis for impeachment of the president in Congress. Mueller's probe has already indicted 19 people, including top Trump campaign officials. No one knows whether Mueller's team has any strong evidence of collusion with the Russians, or of Trump actively obstructing the investigation, another evident thrust of Mueller's probe. The special prosecutor, a former FBI director, has for months been in talks with Trump's legal team over whether the president would agree to be interviewed, as have at least 20 other White House officials and 28 Trump campaign workers. "We're demanding from him -- tell us what you have to get from an interview that you don't already have. Because he has all the facts to make a decision," Giuliani said later on Fox News' "The Ingraham Angle." "There would be a narrow area where we might agree if they could tell us why they need it." If Trump refuses an interview, Mueller could be forced to issue a subpoena to force him to testify, which could spark a legal battle of its own. Giuliani, on a media blitz since joining Trump's legal team a month ago, said the year-old Mueller probe should be ready to wrap up. "If you're going to write a fair report, fine, write it. If you're going to write an unfair report, write it and we will combat it," he said on the Fox News program. "We're ready to rip it apart, and we're ready to rip them apart, if that's what they want. We would rather peacefully settle this and get it over with." Although the precedent of the 1970s Watergate case says that presidential records can be subpoenaed, some scholars say that precedent might not extend to forcing the president himself to testify. If there is a battle over the issue, it would likely end up in the Supreme Court.